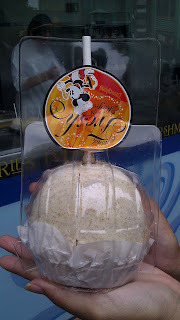 I am big fan of apples, yet of all my year spent at Disneyland I have not tried one of their caramel apples. My parents rarely bought us snacks at the parks growing up and as an adult, I was just being frugal. Plus, they looked hard to eat. Recently, I was strolling through Downtown Disney when my co-creative mind twin Amy and I stopped to watch the chefs decorate fancy caramel apples. We were memorized because we love crafty stuff like this. Plus, it was nice to know that they use everyday products like Marshmallow Jets brand like we do. My friend Roger was so shock when he found out that I have yet to try one and so he bought one for Amy and I to share! This is the Apple Pie Caramel Apple and it was so good! I always though these were too expensive, but it feeds two so that cuts down the price a lot. Amy and I were annoyed that the CM put the sticker on upside-down though. I can't wait to try the other caramel apples now! 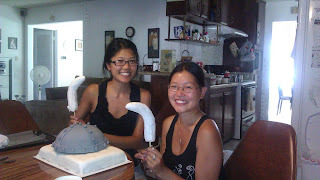 Wow, this Viking Helmet birthday cake I made for a friend's husband's 30th birthday/Fourth of July was a very learning experience for me and my baking partner, Amy. When my friend emailed me sample photos of what she wants the cake to look like, Amy and I thought it would be a difficult, but easily do-able. 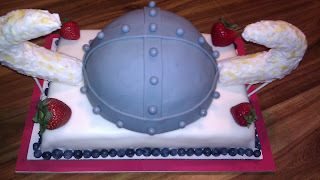 We never imagined the challenges that we would face when creating this cake! Fun times! Trying to figure out the perfect size for the cake to feed 20-25 was interesting because we decided to do a quarter sheet cake with a semi-circle cake on top. The cakes were chocolate with vanilla and strawberry filling, which was delicious! 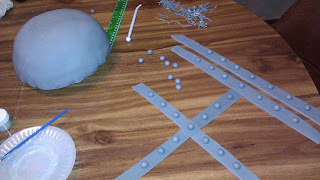 To create the horns of the Viking helmet, we had the option of using different materials, including shaped Styrofoam. Instead, we opted for the edible Rice Krispies treat. Amy was in charge of making and creating these horns, which she foamed so smoothly! 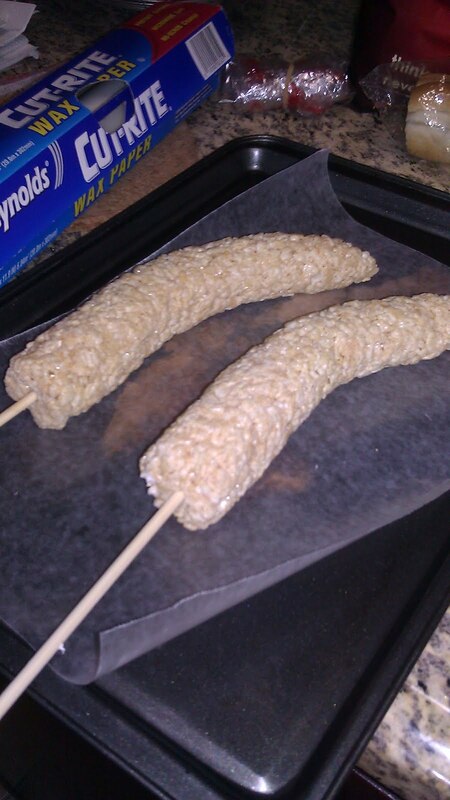 What we didn't take into consideration was how long it would take for the Rice Krispies to harden. Oops! I covered the round Viking helmet cake with tinted fondant and added edible silver dust to give it a metal-like shine. 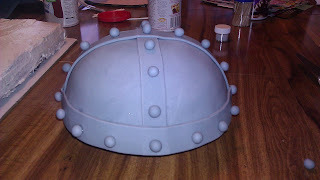 With the extra fondant, Amy and I created the details for the helmet. Notice that every single ball on the helmet is perfect round and evenly sized... that is Amy's doing! Love her! We were really proud of our Viking Helmet, minus the horns. When it came to adding the horns, which we covered in smooth white vanilla frosting and edible gold dust for shine, we realized that the weight of the horns was not going to stand in the helmet cake. Oh no! After much discussion, contemplating, and research, we decide to take a risk and try to add the horns and use lollipop sticks to hold the horns in place. The sticks can stay there until the horns decides to stay in place or it can stay in there permanently. 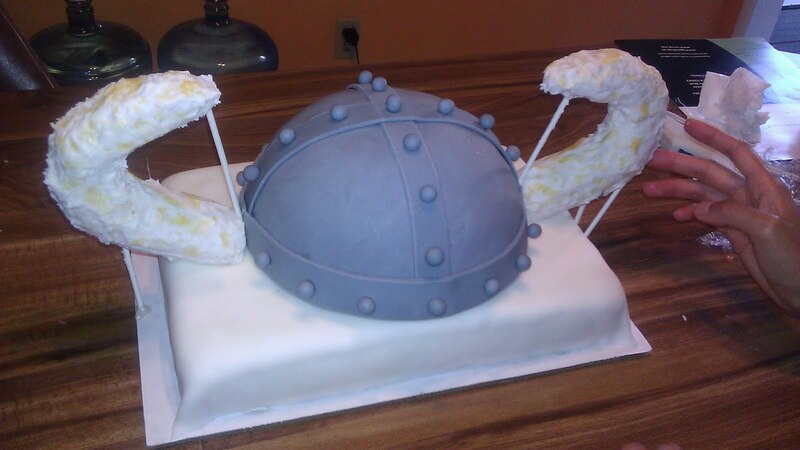 Also, notice the sheet cake the Viking helmet is resting on? Chocolate cake with vanilla frosting and covered in white fondant. That is THE smoothest fondant sheet cake I have worked with and it was all thanks to Amy again! Her attention to detail and ability to perfect things is amazing. I was so nervous about this cake, but after adding some Fourth of July flair (strawberries and blueberries), the overall cake turned out quite alright, if you can ignore the propping sticks. Much thanks to my amazing baking partner Amy for going through this learning experience with me. I honestly don't know what I would do without her! Also, I have to thank my sister Cindy for helping me carefully deliver this cake, which was another stress factor in this experience! I hope the birthday boy had a wonderful time celebrating his big 3-0 and had a happy Independence Day! 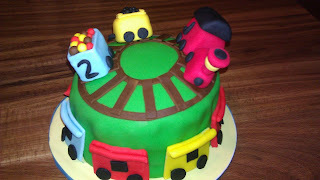 I created a special Choo-choo Train cake for one of my favorite little boys around, who recently celebrated his 2nd birthday. 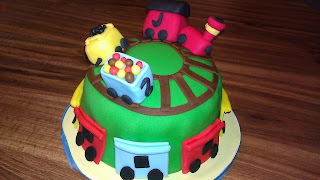 Little J has this fascination with trains and I thought it would be perfect to create a cake that he can call his own. 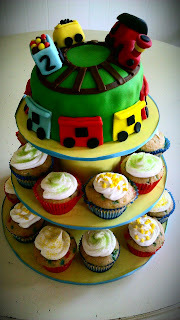 I wanted to create simple cupcakes for the party guests, but include an individual cake for Little J. For this project, I actually played around with creating my own cupcake and cake stand! I got this idea from my super talented friend Tania of Cake4Six. 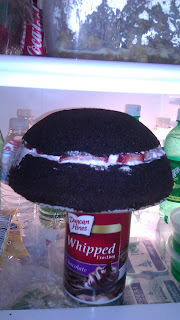 For my cake stand, I used various sizes of cardboard cake circles, styrofoam cylinders, ribbon, and wrapping paper. 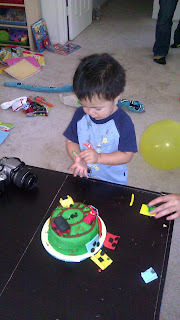 It was really easy to create and it is both inexpensive, disposable, and you can theme it however you want it to look! 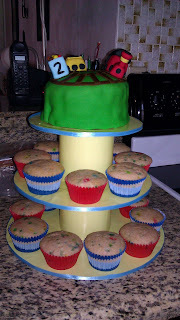 The cake is a two layered 6" Funfetti cake with vanilla frosting. 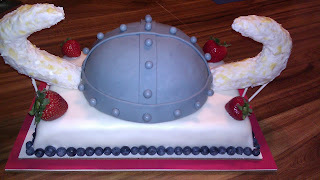 The cake is covered with tinted fondant, as well as the cake decorations. I was lucky to have my good friends Roger and Amy stop by to help me work on the cake details! Roger even left a nice hand grip impression on the actual cake when he went to pick it up, thinking it was just a bowl or a mold! Because the cake was pretty small, we had a difficult time trying to figure how to shape the train-- should we do only the engine? How many passenger trains can we fit? 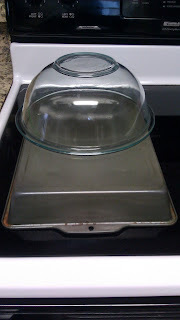 Will it look funny curved on the cake? Should we add train tracks? I was really happy with how the cake turned out! Mucho gracias to my wonderful friends! The cupcake were much simpler. I just made Funfetti cupcakes and topped them with vanilla frosting and colored sanding sugar. Overall, I wanted the cake to have a fun two-year-old feel to it-- bright colors, simple recipes, and large details! Little J seemed happy with his cake and had some fun playing with this "trains" after we sang "Happy Birthday" and blew out the candles! Happy birthday, little one! Love you much!